The address book will show you any saved contacts. This will store names and email addresses so that you don’t have to remember these while composing emails. The left hand side will display all of the saved addresses, and the right side will show the information about the selected contact. The address book can be reached by clicking Address Book at the top of any Webmail page. Add Contact – You may add contacts to the address book where the Display Name and Email are compulsory fields. Delete Contacts – You can select contacts from the left side panel and then use the Delete Contacts option to remove these contacts from the address book. You can select multiple contacts as well. 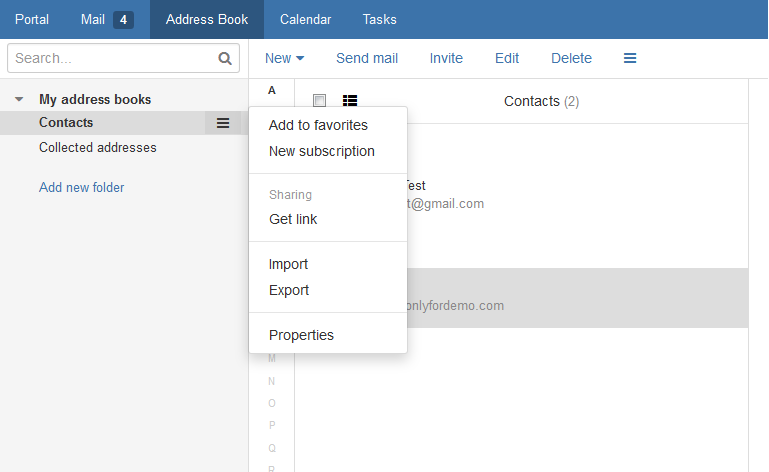 Email Contacts – This will start an email, and automatically fill in the recipient with the selected address book contact. Import Contacts – Import existing contacts from your computer. Export Contacts – Export contacts from your address book in .vcf format and save it on your computer. Search Contacts – This tool will be handy if you have a long list of contacts.